The first classical organ method for children, the Suzuki Organ School is based on Dr. Shinichi Suzukiâ€™s Mother Tongue Method. In order to develop pedal technique, pedal melodies are included between every manual piece. 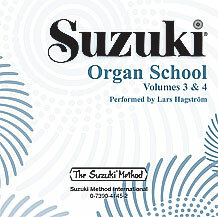 The CD contains model performances of the repertoire contained in Suzuki Organ School Volumes 3 and 4.